Allen Hex Torx Key Sets. 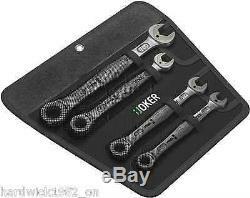 Wera Joker 05020010002 Reversible Ratchet Spanner Wrench Set Imperial 7/16 > 3/4. IF YOU NEED A WRENCH, USE THE REVOLUTIONARY JOKER! For the first time since open-ended wrenches were conceived, the issues with the most useful end, the open jaw, have been resolved. The Joker performs fastening jobs in almost every conceivable situation, quickly and with great precision. The ratcheting feature at the ring end boasts an exceptional, fine tooth mechanism - 80 teeth in all - which provides greater flexibility, even in very confined working spaces. The specially forged geometry, in combination with the high-performance chrome-molybdenum steel and nickel-chrome coating, means that you win three times over: longer service life, high resistance to wear and great protection against corrosion. FASTENER HOLDING FUNCTION: The Joker's holding function means that nuts and bolts can be held in the jaw and easily positioned where they are needed, even in confined spaces where the hand may not be able to reach. Assembly or disassembly can then be done quickly and safely thanks to the innovative special stop-plate which holds the fastener. No more time-wasting searches for fallen nuts and bolts! SECURE GRIP ON FASTENERS, THANKS TO LIMIT STOP: Constant repositioning of the wrench? Difficulty holding fasteners in confined spaces? Easing off to avoid any risks of injury or fastener damage? Today, the Joker prevents slipping off of the fastener head with its integrated limit stop. No longer is the thumb or finger needed to act as a depth stop. That makes things much easier. And: allows much more force to be applied during fastening jobs. SAFER DUE TO ANTI-SLIP EFFECT: The Joker's clever double-hex geometry delivers a very positive connection with nuts or bolts - it's a perfect fit. And the exchangeable, hardened metal gripping plate in the Joker's mouth literally bites itself into the bolt with its extremely hard tips. Both features combine to prevent any unpleasant slipping, even at higher torque. Very small return angle: Less can be more. Particularly in those very confined spaces where conventional wrenches with a 60 return angle literally have to be turned over and over, to tighten and loosen nuts or bolts. Instead of 60, the Joker only has a 30 return angle thanks to its unique double-hex design. Along with the Joker's straight neck, this means that flipping the wrench has become a thing of the past. With the Joker, you can now loosen and tighten nuts and bolts, in situations where conventional tools fail, particularly in confined spaces. EFFECTIVE PIPE UNION WRENCH: Joker provides union nut protection from a combination of the multi-contact Bi-Hexagon jaw spreading the load, serrated gripping plate and absolutely no jaw flex. That is why the Joker is clever. And it looks good too in its own high quality pouch to keep the tools securely stored and for easy transportation! Set contents: 1 each 7/16", 1/2", 9/16", 3/4". Joker - Does it all. 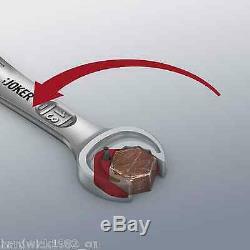 Set of 4 Joker spanners supplied in a box: 7/16, 1/2, 9/16,3/4in. Repairing vehicles is our business with 50+ years experience we feel well accomplished to trade within the automotive sector as a supplier of tools & garage equipment. &###xA0; Most suppliers of automotive equipment & tools do just that and only that. This is where our business has the advantage over our competitors. We carry large stocks for immediate supply, Having our own up to date vehicle workshop and bodyshop we have a wealth of experience & skill to advise on any questions we are asked from technical data to how an item may work. We dispatch items within 24/48 working hours of the order being processed. We keep all our stock levels as accurate as possible but as we sell on multiple platforms sometimes there may be errors that lead us to not having stock of your item, if this happens we will work with you to resolve this as quickly as possible. To request an item return. You may be asked to sign in. Next to your listing, select Return this item from the pull-down menu. The "Return an item" form appears. This listing is currently undergoing maintenance, we apologise for any inconvenience caused. 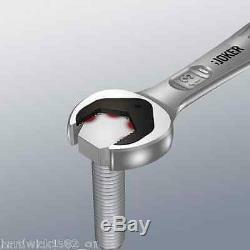 The item "Wera Joker 05020010002 Reversible Ratchet Spanner Wrench Set Imperial 7/16 3/4" is in sale since Thursday, January 16, 2014. This item is in the category "Business, Office & Industrial\Industrial Tools\Other Industrial Tools". The seller is "hardwick1982_on" and is located in Sutton-in-Ashfield. This item can be shipped worldwide.